Top 10 Things to Cool you Down! It gets hot in Florida and it only gets hotter when you are walking around the parks during the day. Here is my list of top ten things to help cool you down while in the parks. 1. A Mickey Premium Bar! Nothing cools you to the core quite like a mouse shaped vanilla ice cream dipped in chocolate. Find a shady spot and indulge yourself. 2. Dole whip float. I actually cheat on this one and get vanilla ice cream in pineapple juice instead of the pineapple on pineapple combo. However, if I’m just getting the frozen treat without the juice I will get the pineapple delicacy! It is good to note that the citrus swirl is also a good choice and can be found at Sunshine Tree Terrace right around the corner from Aloha Isle. 3. 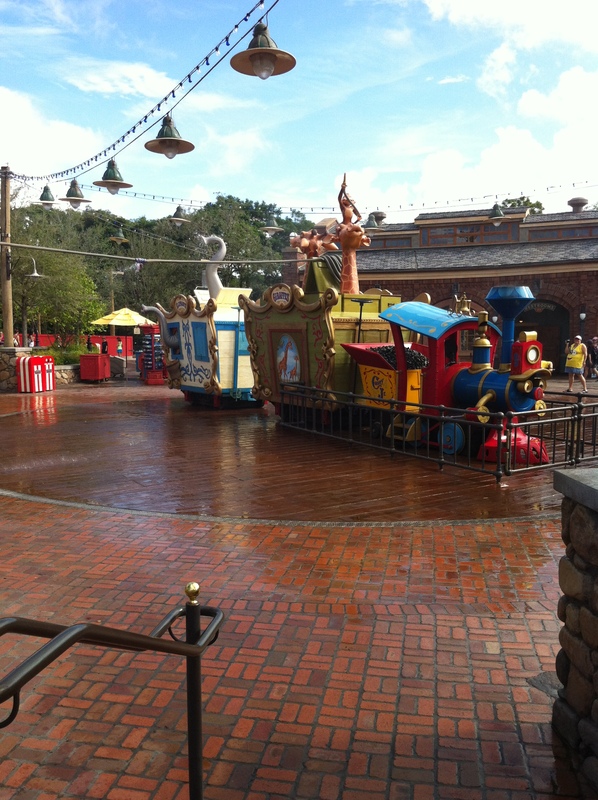 Casey Jr. Splash and Soak Play area. 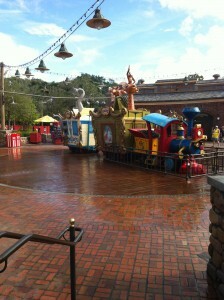 This little water play area is located within Storybook Circus at The Magic Kingdom. Take a moment to get soaked on a hot day and you will cool down pretty quickly! Warning! Soaked is the key word. This is not just a little spritz. 4. Splash Mountain. Not only is the grand finale the best remedy for a warm day, but it is cool inside the attraction as well. As your log floats through the singing scenes, you will enjoy the respite from the heat! 6. Carousel of Progress. Ok, I am going to let my geek show a little bit. I love this attraction! The bonus is that it is in a dark and air conditioned room. Plus it is a lengthy show! 7. Kaki Gori- You can find this shaved ice treat at the Japan Pavilion in Epcot. This sno-cone like treat comes in flavors such as strawberry, cherry, melon, and tangerine. Yum! 9. Singing in the Rain- At Hollywood Studios near the Lights, Motors, Action Extreme Stunt Show, you will find an umbrella. If you stand on the square and hold the umbrella handle you will get your own personal shower. Nice! 10. Stormalong bay. Yes, it’s true, only guests of the Yacht and Beach Clubs can experience this one but it had to go on my list. This is more than just a pool. Its a beach, a waterfall, a lazy river, and a slide. It is amazing and if you ever get the chance to stay at one of these resorts pack your swim suit! ← Fastpass; A How to Guide!